Keep a visual record of your North American travels with a Wayfarer push-pin travel map. 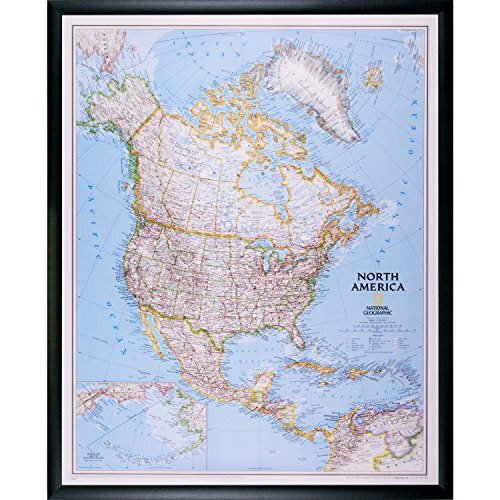 From the adept cartographers of National Geographic, the print depicts a Lambert conformal conic projection of North America in it's finest detail. Token flourishes and a vibrant color palette personify contemporary styling, suitable for the more leisurely of home decor. The map comes framed in our 1WB3 Contemporary, featuring a square profile and slightly convex surface, finished with a smooth black wrap. Alternate uses for the Wayfarer include: office or customer locations, genealogy, research, and education. Let only your imagination be the limit.